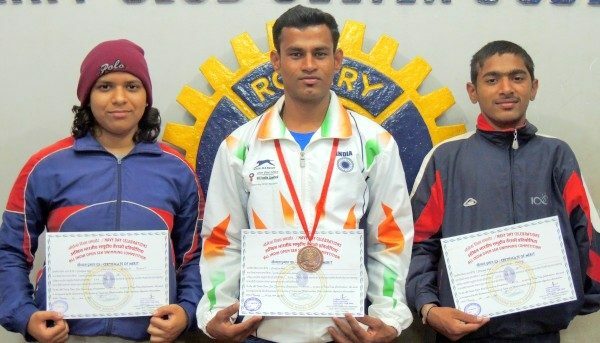 Differently abled Swimmer Umesh Khande, Physically Challenged Shridhar Malagi and Akshata desai participated at All India Open Sea Swimming Competition held on 17th November 2016 at Navy Nagar, Mumbai. The competition is organized by the Flag Officer Commanding in Chief, Western Naval Command, Mumbai on the occasion of Navy Day. Nearly 600 swimmers from all over the India took part in this competition. Umesh Khade won the Bronze Medal in the Differently Abled group where has Shridhar Malagi stood 4th and Akshata Desai stood 9th. They are honored with Medal, Certificate and Cash prize.